Will this mixer allow me to record with three microphones for a podcast? 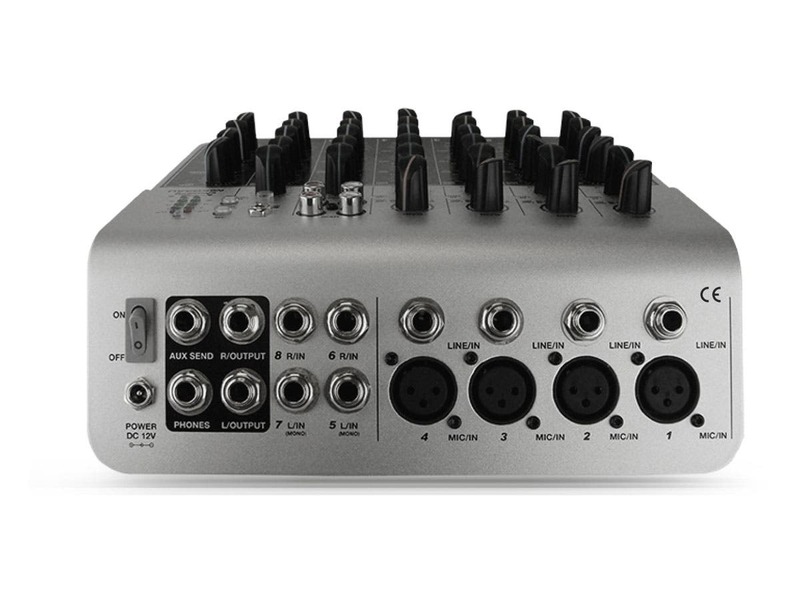 BEST ANSWER: This mixer will allow you to record from all inputs simultaneously. It will only record as a two-track master or as 2 independent tracks if you hard pan to left and right. I would answer with a qualified yes. It depends on your setup. It is not a true audio interface, meaning that each input does not come across as an individual track. But, if you wanted to mix on this mixer, and record as one track, then you can record 4 mics. I’ve recorded a couple podcasts with 3 mics on this mixer. Just make sure your levels are right and it’ll sound amazing. Might need to check your mics and see if they need phantom power or not. The mixer will provide the phantom power to the mics if need be. Enjoy. Yes, plug all mics into the mixer and the out goes into your recorders input. Yes it will. It has 4 mic inputs. Could this mixer be used to route three or four electric guitars to a guitar amp? BEST ANSWER: Technically you can. It is a little tricky since your amp is looking for a lower leval signal from a standard electric guitar. This mixer will put a lot more signal in to the amp. You will need to play with the setting to get the tone you are looking for. The extra output of the mixer might be pretty cool for getting more gain out of your amp. You could in fact do this. That said, you'll get better, clearer sound taking the guitars (or any four simultaneous instruments) to a PA. You would need to use the AUX output since the primary is via separate left and right outputs. Yes, there are 1/4" TS inputs to handle the guitars and several 1/4" TS outputs to choose from to go to the amp. It could be with some tweaking. I use it with one electric guitar and one microphone to record to my computer. Can the unit be powered via usb power? I’d like to use a usb power supply battery for portable application. BEST ANSWER: No, this mixer is only powered from the included power adapter. I would not recommend trying to power the mixer using the USB connection. First, the schematic in the manual is not complete enough to allow for a determination that there would even be continuity from the USB port to all of the critical circuits of the mixer. Second, the mixer power supply is rated at 12 volts DC while USB supplies output 5 volts. In short, I would not try to power the mixer in this manner, lest doing so damage the mixer. If you want to power the mixer by a battery, look for a 12 volt battery or configure one from two 6 volt batteries or 8 D cells and obtain a matching coaxial plug for connection to the mixer. Consider using a 2 amp fuse in the positive line of the wiring from the battery to the power connector. Pay careful attention to the polarity of the wiring. The center of the connector is positive (+) and the outer sleeve is negative (-) according to the diagram on the back of the mixer. Measure the voltage before connecting to the mixer. Not without some type of converter. The unit is powered by a 12 volt, 1.5 amp adapter. Yes you can. Just match the bolts and Amps with you r battery. No. It must be powered via included power supply. do I use regular instrument or speaker cables for the "mono 1/4" TS"for the r and L outputs? Does it matter? BEST ANSWER: Use regular Instrument cable for the output of this mixer. Speaker cable are not shielded and are susceptible to noise and interference. yes, it matters. Speaker cables are not noise shielded (the ground wire wrapped around a center wire). Instrument cables are shielded but clumsy for more than a couple of feet. Thick gauge audio cables are best since they are shielded and paired together. Other than the unbalanced stereo headphone output, all other analog outputs are mono, unbalanced 1/4” TS. So a standard 1/4” TS instrument or speaker cables will work for output signal connections. If you are transmitting over long distances, you may consider unbalanced to balanced converters, and XLR cables. Don't use speaker cables, they're not shielded. Must be a shielded cable like an instrument cable. 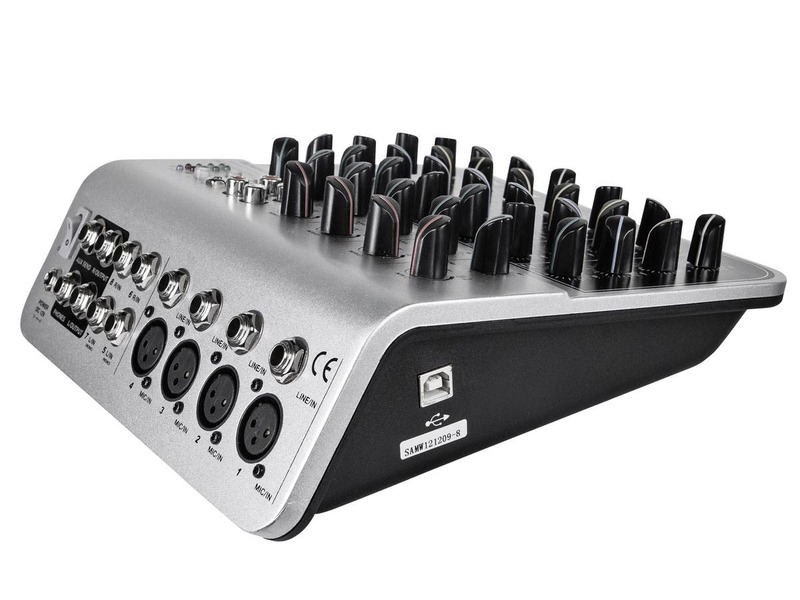 The Monoprice 8-Channel Audio Mixer with USB is suitable for MAC versions? I have a MacBook Pro 13-inch, Mid 2012. This mixer, when connected to a Mac via USB, will show up as an audio device called "USB AUDIO CODEC". I was able to record from the 2-channel output (master) to Adobe Audition and play back to the mixer (press the "2TK TO MAIN" button). MacBook Pro, Mid 2014 running High Sierra. According to the manual it does have USB drivers for Mac OS. But I personally use the analog out to 3.5mm jack for my microphones. I don't believe it comes with the USB cable, but they are fairly cheap. 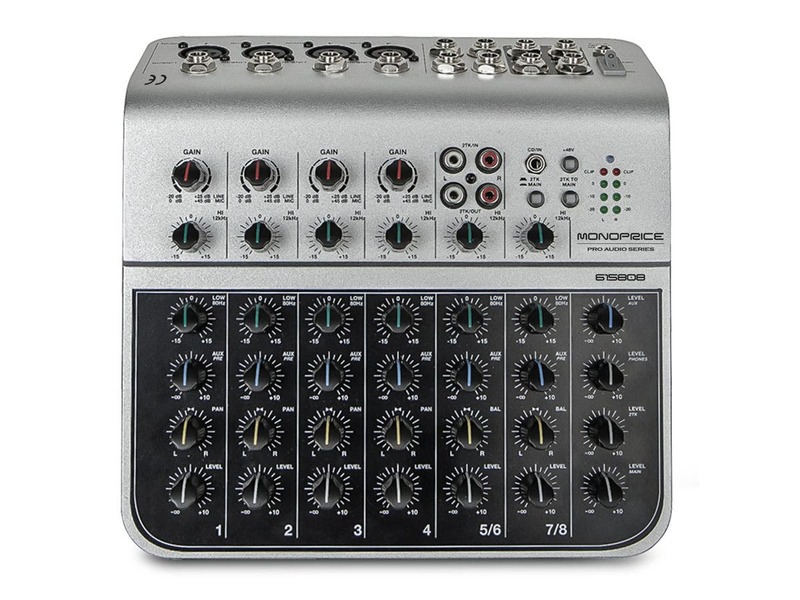 Can this mixer power my blue yeti USB mic from input usb on mixer? BEST ANSWER: As far as I know this mixer uses professional audio cables. I ended buying XLR Male to XLR Female 16AWG Cable. And a Large Diaphragm Condenser Microphone. All I bought from monoprice. If you wanted to use a USB microphone you might have to get a USB to XLR connector. No, the USB port on this mixer is an upstream connection to go to the computer it is interfacing to, not a downstream supplying power/connectivity to a device. This doesn't have a USB input for mics (or anything else) -- However, if you're just asking about phantom power, yes it has it. is there any way for me to mute the speakers but still listen through my headphones? BEST ANSWER: There is no specific mute switch. You would have to turn down the volumes for the mains and/or aux sends (depending on your system configuration) and keep the headphone volume up in order to listen to the mix without sending it to your amp/speakers. Yes, there is a separate Level for the output and Headphone Level output. In that case, your only other option would be to turn off or mute the stereo/amp. I have not found a way to do that. Is this able to drive the speakers included with PID: 604355 or would I need an amplifier? BEST ANSWER: Item 604355 (PA) includes a basic board and amp for the speakers. You can feed everything directly into it, versus plugging into a mixer like this one. Unless you were wanting to add more inputs than the PA allowed for, not sure why you would want the mixer in the configuration (save perhaps for outputting to USB from the mixer, which the PA system doesn't provide). That said, I do have both items, and it is a nice little mixer for the price. yes it drives the speakers (not super loud but it works fine for basic microphone at a trade show kind of thing which is what I bought it for. A concert sounds system it is not. So I have the PA system that's linked above, the right side channel is blown and I use it to show movies on an outdoor screen. So you think the mixer will put out comparable sound to the one included with the system? You don't need an amp or a mixer with PID 604355, since they are both included. But yeah, that mixer will play sound through those speakers. Thanks Ben, the problem is that the included AMP/Mixer won't output to the right side anymore so I'm looking for a cheap fix. Can this product record all 8 tracks simultaneously into a DAW? Been looking for something to record multiple drum mics with that's cheap. BEST ANSWER: No, this mixer will only send 2 channels to your DAW. As mentioned, you will get 2 channels output through the USB. For basic recording of drums, it is fine to create a stereo track; you just have to play around with levels and such before you record. However, with the 2 channels you obviously can't do any post production on individual drums. The bigger downfall for me with using this as a mixer for recording drums is that, 1) channels 5/6 & 7/8 channels are not independently adjustable of each other, and 2) it only has 4 XLR inputs. That said, it does OK with a couple of overheads, snare and kick mic'd (4 channels). Yes, I use it on my Windows 10 system. Yes, that's how we're using it. If I get a USB to lightning cable can I use my iPad as the recording device? I want to do a podcast and don't want to spend too much money upfront but want the ability for a 3 mic set up. BEST ANSWER: Interfacing with an iPad I *don't believe* is possible in that method, through the Mac computer it is able to interface with the driver, however the iPad is running iOS which isn't designed for that method of use. I have used it as an interface for "Garage Band " on my mac. I know use it as a mixer for my acoustic band. hi can I add any effects from my computer (destortion, phase ....) and can I control volume and the other things from the computer ? BEST ANSWER: This unit mixes together your audio sources from your computer's line, headphone, or USB and boosts the signal. Your computer will have volume control, but will only have effects if you have separate software installed for that. What is the output on the power supply? I know it's 12V, but what is the amperage? BEST ANSWER: Thank you for your interest in this USB mixer. The adapter provides 12 VDC, 1.5A of output power. It can accept any AC power input between 100-240 VAC, 50/60 Hz. It has a 1.3mm pin diameter and a 5.0mm barrel diameter, with pin/tip positive. It uses an non-polarized NEMA 1-15 AC plug configuration. do you have mixing controls on the 3.5mm trs port? I need to be able to turn up/down the bass on a phone/computer. BEST ANSWER: Thank you for your interest in this mixer. The CD In 3.5mm does not have bass and treble control, only level. You will need to use the 1/4" inputs on CH 5/6 or 7/8. Are all 8 channels individually available via USB to record to individual tracks in like Audacity or is it only stereo? BEST ANSWER: Thank you for your interest in this USB mixer. The USB will only carry 2 tracks of audio to record. Use the PAN controls set hard left or right for 2 channel operation to record to 2 separate mono tracks. BEST ANSWER: So the answer is two parts. The first, yes you can connect this to any software as it is seen as a USB audio device with stereo audio in/out. Part two, no, you can't attach effects to each channel as what is seen by the computer, is just the stereo mix, so you get left and right in/out, with all the channels combined into that one stereo mix, so any effects you apply will be to all channels. Simply, a great deal. Too good to pass up. Amazing how far a dollar will go at Monoprice. This little mixee exceeds expectations by plenty. A Swiss Army knife for not a lot of money. I'm using it for a submixer for keyboards, sending to both main console and on-stage amp.Lots of features, lots of solutions to everyday problems, for NOT a lot of money. Simply, a great deal. Too good to pass up. Sample rate when recording is 48KHz. You can really tell that it isn't enough when your headphones operate at 192KHz. I bought this as a backup to a mobile podcast I do. This thing is so easy to use that I have found myself using it more than the main mixer that I own that costs literally 6 times more than this one from a competitor. Monoprice does have some jewels out there, you just gotta find them. This is one. Great unit at a bargin basement price! Great top quality unit in a compact size ... which is what we needed for our road production. I can't believe the quality for the price that we paid! 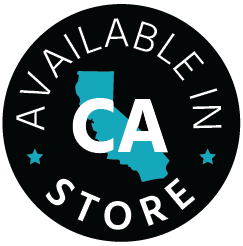 Our bigger unit cost 5x more and only has a few additional features! Great, learning the cd inputs and some other thing is a little hard stand alone. When connecting to a computer acrs as input and output, great for streaming or secondary mixer. I'm not a huge Mixer head... If that's a thing. But this Mixer works amazing. The USB is stated on all reviews as not output BUT thats how i've been recording. I also have to have both 2tk main and 2tk to main pressed to have it work properly. I've been told this makes no sense (I could be told wrong) but when both are pressed and I add the phantom power everything works as needed. The depth of leveling two seperate mics is awesome BUT I did notice Mic 3 (which could be because it's not the same model as Mic 1 and Mic 2) doesn't seem to be captured as nicely. Comes with a awesome mic stand attachment making it easy to place between the two mics and adjust as needed. The audio input works awesome with a smart tablet loaded with a SFX app that allows for bumper music between podcast segments. However I have noticed that when you don't have the tablet plugged in and the aux cord is attached there is a hum. If you'd like to hear what this mixer can do alongside Monoprice mics you can find audio examples on my podcast Plug and Play podcast available basically anywhere. listen to any episode after 177 which is the first episode you used this mixer on. With small tweaking on the mixer I've been extremely pleased with the results. First impressions... seems like a good little mixer, especially for the price (in typical Monoprice fashion!). Analog sound is very clean. Haven't tried the USB yet, but excited to now have something I can record from digitally at home. I'd love for this to have XLR outs on it, but appreciate that in a footprint this small and at this price point, that would be tough. One other minor criticism is the placement of knobs. The high and low gains placed together (in the black area) would be easier to get used to; not intuitive in my mind to have one above and one below... I think perhaps the balance or pre up top in the grey area would have been more user friendly from a human factors standpoint. A little noisy, died after 13 months. A little noisy, but worked for my purposes. Until it died exactly 1 month after the warranty expired. You basically get what you paid for - a cheap little mixer with a limited work life. Works great. Everything is really nice. Fast shipping! Would order this again for sure!